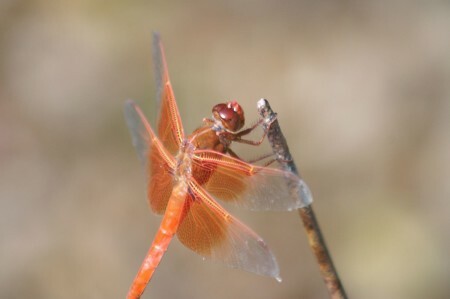 While watering our neighbors garden, as they are gone to yet another wedding, Melissa and I saw this bright red dragonfly. It appears to be a male King Skimmer (scroll down for a picture). Every minute or two, it would take off from its branch, hop around in a few circles, and land on the very same stick again. Very nice photo. The linked page is interesting; I had no idea there were so many different dragonflies in Calif.